This month, I have two projects on Craft Project Central. 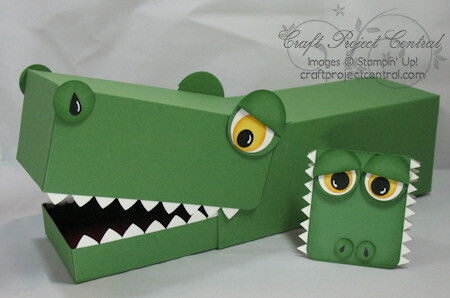 My first entry is this crocodile valentine box with matching 3 x 3 valentine card. 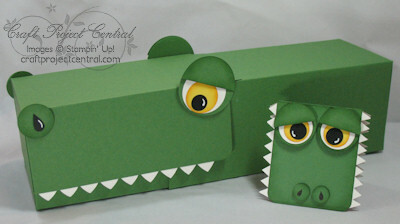 This box is the perfect size for kids to use for their valentine exchange. The mouth opens and closes for easily putting cards and treats inside. The box colors could be changed for a dinosoaur look as well. Try leaving off the jagged teeth for a Hippo (add a couple small tags in front for the teeth). This box has so many fun uses! To get the instructions for this project and 9 other wonderful projects, head over to Craft Project Central and join the January 2012 edition for only $10.